First off lets get a little up date to what happened over Norway December 9th 2009 hours before Obama excepted the Nobel peace prize only a few hours away from were the phenomenon happened. I along with many others believe there is no way that this was just a coincidence. To have such a visual test of power along with the president of the United States accepting the most prestigious award both in Norway. I say Noway!! The trajectory of Norway spiral has reviled it's source. After studying the photo's and video's, many people through out the scientific community, have come to the conclusion that the Norway Spiral came from the EISCAT which works the same and in conjunction with the HAARP out of Alaska. There are many of these facility's world wide and all of them work in conjunction with each other in order to control temperatures in the atmosphere. Well that's what they will say publicly anyway. On the conspiracy side of things, people from around the world all agree that these facility's are meant for much more than controlling the atmosphere, if that wasn't enough as it is. The spiral over Norway was a sheer test of power. The fact that it's now known that it's source was the EISCAT we now know there is something much bigger at hand. What exactly was this spiral? 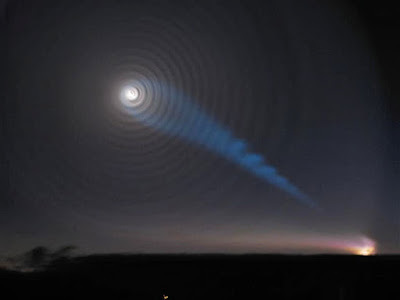 Some people believe this to be a test of the "Blue Beam Project". Makes sense considering that there was a large blue beam of light right? What is the Blue Beam Project? 1. The first step is to break down all knowledge of archaeological artifacts. Earthquakes will be created that will unearth new and unusual artifacts which they will use to support their coming lie. These falsified artifacts will be used to make the population believe that all religious doctrine has been misinterpreted and misunderstood. It's 2010 and the Haiti quake has happen. Numbers of the dead will reach Hundreds of thousands. Christians from around the world are calling this the wrath of god on a sined nation who has not excepted Christ as their savor. So far if this was a part of Blue Beam, this act will have only strengthen Christian beliefs, but it still could be used to their advantage. Could the first step have already begun? 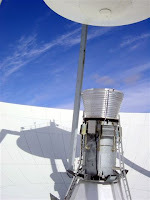 2.The second step will be the incredibly awesome laser-light space show that will appear up to sixty miles in the sky. 3D holographic images of God like figures. In the states it will of-course be Jesus, in India it will be Krishna, In china they will have Buddha, the middle-east will have Allah. 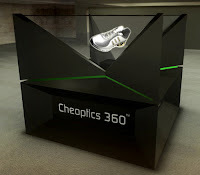 These figures will be projected as 3-dimensional holograms that could fit on 100 imax theater screens. These figures will appear to be alive with full body motion, facial expressions, and speech. 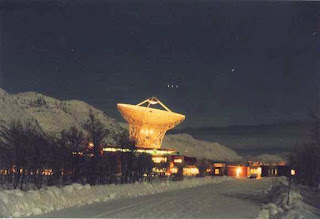 They will create this show using huge antennas in coordination with thousands of satellites. On December 9th 2009 (same day that Obama receives the Nobel peace price and the Norway spiral) appeared a huge mile wide Pyramid over the Kremlin in Russia. 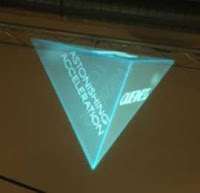 Was this 3D holographic image testing of the Blue Beam Project?? It would seem so. This was real and it was on the news. 3.The third step is going to be a telepathic electronic two-way communication system that will do everything thing in it's power to get into your mind. It will appear as if your inner self is talking to you. They will achieve this through ELF(Extra Low Frequency), VLF (Very Low Frequency) and LF (Low Frequency) and will reach every person on the planet. This third step will work together with step two so when the project is activated, a new "Messiah" will appear. Now while representing that country's biggest religious icon, these different frequency's will prob your mind to trick you into believing that what you your seeing and hearing the real thing. Your god will be speaking to you, in your mind, hypothesizing everyone on the planet. Even non believer's will believe because it will be the greatest illusion the planet has ever known. All of the God's from every different religion will meld into one religious leader, creating a one world belief under a New World Order. 4. An electronic universal supernatural manifestation designed for the soul purpose of deception will then create an even greater illusion. This illusion will be created to make all humans of the earth believe that an global alien invasion is imminent. There will be projections of massive alien mother-ships hovering above the earth. 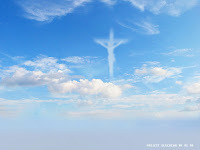 Christians will believe this to be the rapture, judgment day. The reason for this is to make the people of the world think that the aliens have come to earth in order to rescue us from our own demise, and to convince the world that a global satanic supernatural force will manifest throughout the world. This depiction will be guided through optic fiber cables, coaxial cable, and phone and power lines which surround us all at all times wired within our infrastructure. The only escape are vast areas in nature, like the Mohave dessert, or above ten thousand feet. With the coming of 2012, this marks the dawning of a new age no matter what you believe. No, I'm not saying the world is going to end, but something miraculous may happen on 12/21/12 at 11:11. This date is significant because it's a mark on a time line. 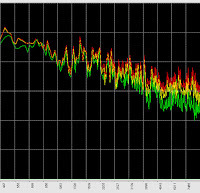 Just like when the winter solstice passes on the 21st of December, the day's only get longer. It's simply a maker in time, but just happens to be the greatest marker of time in our lifetime. The Governments of the world know this and it would make sense to me that they would use this to their advantage in any way they can. Maybe this will be the day of the first projections in the sky. 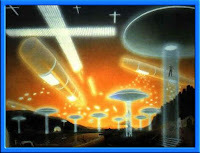 The Blue Beam Project will be to some the return of the Antichrist, or the day god returned to earth. Think about this for a second. The government's of our world are able to create perfect spirals of light spanning up to a hundred miles across with out being effected by wind or any other weather conditions. Now when you see this spiral, before it starts to dissipate it seems to open some sort of portal. Maybe a wormhole or star-gate. Just maybe this wormhole in time and space opens into another dimension where something of great magnitude and stature will come through and appear among us. This would relate to the biblical passages where god or Jesus return to earth. The Blue Beam Project will be a "Laser light Show" with astronomical proportions and will project incredible three-dimensional holograms on the sodium layer located sixty miles in the earth's atmosphere, while being able to generate sound in every region of the planet . The voice of this projection will be in every different language claiming to be the true god. 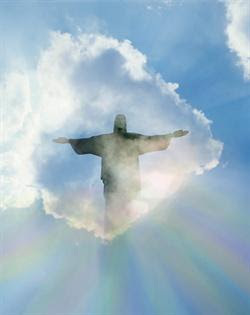 This "New God" will prove to all people, that their religions have all been misinterpreted and misunderstood. 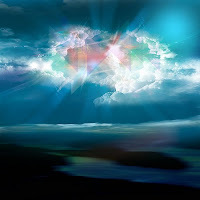 It will resolve the conflict between all religions because of the undeniable fact that this phenomenon will have taken place in the sky throughout the entire planet. "The calculated resistance to the universal religion and the new messiah and the ensuing holy wars will result in the loss of human life on a scale never imagine before in all of human history. 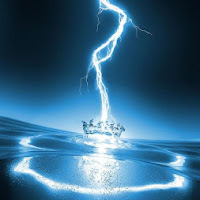 The Blue Beam Project will pretend to be the universal fulfillment of the prophecies of old, as major an event as that which occurred 2,000 years ago. In principle, it will make use of the skies as a movie screen (on the sodium layer at about 60 miles) as space-based laser-generating satellites project simultaneous images to the four corners of the planet in every language and dialect according to the region. 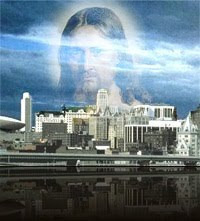 It deals with the religious aspect of the new world order and is deception and seduction on a massive scale. 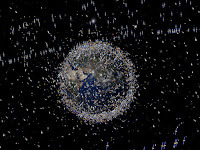 Computers will coordinate the satellites and software already in place will run the sky show." "Holographic images are based on nearly identical signals combining to produce an image or hologram with deep perspective which is equally applicable to acoustic ELF, VLF and LF waves and optical phenomena. Specifically, the show will consist of multiple holographic images to different parts of the world, each receiving a different image according to the specific national, regional religion. Not a single area will be excluded. With computer animation and sounds appearing to emanate from the very depths of space, astonished ardent followers of the various creeds will witness their own returned messiahs in convincing lifelike reality. Then the projections of Jesus, Mohammad, Buddha, Krishna, etc., will merge into one after correct explanations of the mysteries and revelations have been disclosed. This one god will, in fact, be the Antichrist, who will explain that the various scriptures have been misunderstood and misinterpreted, and that the religions of old are responsible for turning brother against brother, and nation against nation, therefore old religions must be abolished to make way for the new age new world religion, representing the one god Antichrist they see before them." Sounds simply mad right? I mean, down right crazy. You may be asking yourself, how could they possibly do something like this? "The Soviet's have perfected an advanced computer, even exported them, and fed them with the minute physio-psychological particulars based on their studies of the anatomy and electro-mechanical composition of the human body, and the studies of the electrical, chemical and biological properties of the human brain. These computers were fed, as well, with the languages of all human cultures and their meanings. The dialects of all cultures have been fed into the computers from satellite transmissions. The Soviets began to feed the computers with objective programs like the ones of the new messiah. It also seems that the Soviets - the new world order people - have resorted to suicidal methods with the human society by allocating electronic wavelengths for every person and every society and culture to induce suicidal thoughts if the person doesn't comply with the dictates of the new world order." The passage with quotation's around it comes from dozens of different web sites so I'm not sure of it's original source. Either way, it's all over the internet. Now to add to the above explanation on how they would go about projecting these image's and sounds are in direct correlation of the four large frequency antenna's stationed throughout the planet along with the thousands of satellites that surround the earth. 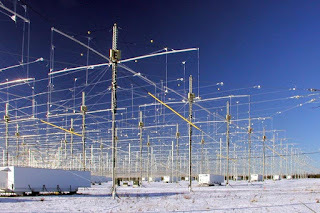 Which are the HAARP in conjunction with HIPAS located in Alaska , EISCAT in Norway (Where the Norway spiral was produce) with additional receiver stations located in Sodankylä, Finland, Kiruna, and Sweden, Sura Ionospheric Heating Facility located in Vasilsursk Russia and GWEN or Ground Wave Emergency Network with antennas located in 22 of the 48 state region in the United Sates. Some believe that even cell phone towers are taped into the Blue Beam Project. Lets also not forget about the chemtrails of microscopic metals being sprayed into the atmosphere by military planes by the tons, in order for the these signals to be much stronger and so the 3D holographic images are much clearer when they appear and the mind control frequencies will be much stronger. All of these antennas will work together to control the frequencies needed in order to create a life-changing global event such a new messiah speaking from sixty miles the sky. It's this same network of antennas that also can create earthquakes and super-storms throughout the world. On top of having control of all electronically controlled systems, including electrical grids and satellites which in hindsight means control of just about everything. All communications such as broadcasts, radio waves, phones, will all be under control by this one force, the small elite few behind the project. In 1974, researcher G. F. Shapits, stated, "...in this investigation it will be shown that the spoken words of the hypnotist may also be converted by electromagnetic energy directly and to the subconscious part of the human brain without employing any mechanical device for receiving or transcribing the message, and without the person exposed to such influence having a chance to control the information input consciously. It may be expected that the rationalized behavior will be considered to have been taken out of their own free will." I hope that the picture is starting to become clear, the fact that this will be controlled by supercomputers that know everything about everybody on the planet, it could theoretically hypnotize every person on the planet believing that the god that their seeing in the sky is there own speaking through their soul. "The computers were fed with all the different languages and their meanings, the dialect of all peoples were fed to the computers with objective programs." In January 1991, the University of Arizona hosted a conference entitled, "The NATO Advanced Research Workshop on Current and Emergent Phenomena and Bio-molecular Systems." I wonder what was discussed? A statement by psychologist James V. McConnell was published in a 1970s issue of Psychology Today. "The day has come when we can combine sensory deprivation with drug hypnosis and astute manipulation of reward and punishment to gain almost absolute control over an individual's behavior. It should then be possible to achieve a very rapid and highly effective type of positive brainwashing that would allow us to make dramatic changes in a person's behavior and personality." To make people truly believe that what they are seeing is miracle. This is the power that can tap into the minds of people in such a way that it will feel like your inner soul is sending you the message. 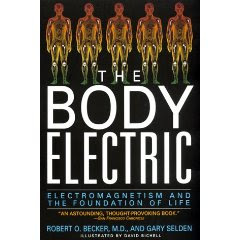 "In his book, "The Body Electric," Nobel Prize nominee Robert Baker describes a series of experiments conducted in the early 1960s by Allen Frie where this phenomena was demonstrated as well as later experiments conducted in 1973 at the Walter Reed Army Institute of Research by Dr. Joseph C. Sharp who personally underwent tests in which he proved he could hear and understand messages delivered to him in an echo-free isolation chamber via a pulsed microwave audio-gram which is an analog of the word's sound vibration beamed into his brain. Baker then goes on to state, "Such a device has obvious application for covert operations designed to drive a target crazy with unknown voices or deliver undetectable instructions to a programmed assassin." Now figure out when we hear that voice from the new world messiah who would be speaking from space to all of the sane people of the earth who might give instructions to zealots and religious fanatics, we would see hysteria and social mayhem on a scale never witnessed before on this planet. No police forces in the world, even as a combined front, could deal with the disorder that will follow! 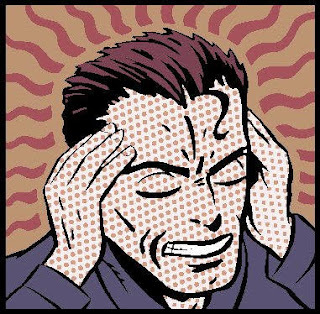 A 1978 book entitled, "Microwave Auditory Effect and Application," by James C. Lynn describes how audible voices can be broadcast directly into the brain. This technology could actually allow the blind to see and the deaf to hear. Instead, it has been turned into a weapon to enslave the world. Allen Frie also reports that he could speed up, slow down or stop the hearts of isolated frogs by synchronizing the pulsed rate of a microwave beam with the heart itself. According to Robert Baker, similar results have been obtained using live frogs, which shows that it is technically feasible to produce heart attacks with rays designed to penetrate the human chest. EDITOR'S NOTE: Both the author of this report and his colleague died of "heart attacks" only days apart one in Canada and the other while visiting Ireland. Neither had a history of heart problems. I should mention also that Dr. Baker does NOT participate in such research. It has been demonstrated that focused ultra high frequency UHF electromagnetic energy beams can be used to induce considerable agitation and muscular activity or induce muscular weakness and lethargy. Microwaves can also be used to burn human skin and aid the effect of drugs, bacteria and poisons or affect the function of the entire brain. These effects were all revealed at length by the CIA on September 21, 1977 in testimony before the Subcommittee on Health and Scientific Research. Dr. Sidney Gottlieb." "Other mind-to-mind induction techniques are being considered. If perfected this capability could allow the direct transference of thought via telepathy from one mind or group of minds to a select target audience. 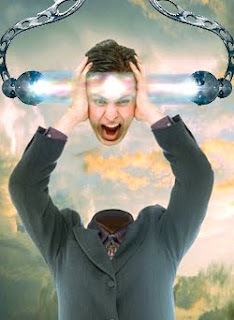 The unique factor is that the recipient will not be aware that thought has been implanted from an external source. He or she will believe the thoughts are original." This is exactly what we were talking about. 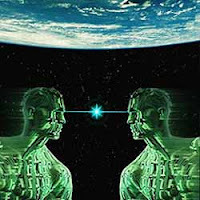 The third step in the NASA Blue Beam Project is called the Telepathic Electronic Two-Way Communication. 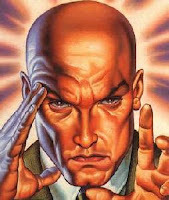 Lt. Col Alexander's article continues: "If it is possible to feed artificial thought into the multigenic field via satellite, the mind control of the entire planet is now possible." "An individual's only resistance would be to constantly question the motivation behind their thoughts and not act upon thoughts which they consider to be outside their own ideological, religious and moral boundaries." Once again, it is wise to consider how television, advertising, modern education and various types of social pressure are used to manipulate those boundaries. It has been reported by Lt. Col Alexander who said, in the summary of his Military Review article, "The information on those kinds of technologies presented here would be considered by some to be ridiculous since it does not conform to their view of reality. But some people still believe the world is flat." For the skeptic or for just the non believer, if you can't allow yourself to open your mind to the possibility that this is real. If this day comes your mind will not be prepared and you will then be under the full control of the One World Government. You will have know choice but to believe what you are seeing and being told. Go outside and look up into the sky and try to imaging what it would be like to see a 3D holographic image of a huge religious figure spanning 50-100 miles across moving and talking to you as if you had head phones on. The world will now be a one world people, because of the fact all humans will have been effected by this event. It's truly unimaginable. God is going to come down from the sky and speak among the people, when in reality it's the puppet masters here on earth putting on the show pumping signals into our heads getting us to believe that gods are talking directly to each and everyone of us telling us that an alien race is going to save the human race and that these aliens are the true gods of the planet, literally. This event will be on such a grand scale, most people will have no choice but to believe what there seeing and being told. It will resonate in your mind and will take every bit of brain power you have to withstand the magnitude of these frequency's. 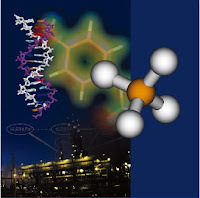 One last thing I feel I must mention is the coming radical mutations of our DNA. DNA is directly effected by the cosmos. Our DNA here on planet earth and throughout the solar system is going to change radically and quickly. At least that's what many of the top scientist around the world believe. That the Mayans knew about a change that would occur in our solar system, this change is the fundamental piece of the puzzle that's missing. Many people feel this piece of the puzzle is now under-stood. Cosmic gamma rays have been bombarding our solar system since the beginning of time. It's just sometimes more then others. 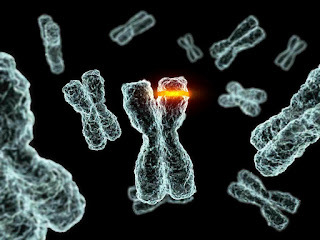 Many scientist also believe that it was a gene mutation that split humans from ape and studies show that it may have been caused by DNA damaged due to a heavy burst of gamma ray activity. It's also said that evolution of DNA is happening all the time due to these gamma ray's. New mutations can also be induced by mutagenic chemicals and high-energy electro-magnetic waves. 2012 marks a new beginning of the entire planet and everyone on it. The Mayans some how knew this change would come, and the change will come in the form of gamma rays that our world hasn't experienced for thousands of years and is said to change our DNA will change quickly and radically. Life and consciousness as we know it will cease to exist. Life work in cycles, and this is just the beginning of a new cycle. The Blue Beam Project will take advantage of this moment and guide our minds in to the new era as our DNA goes through these mutations. Will The Blue Beam Project be able to manipulate these gamma rays while it rewrites our DNA to change humans into what they want? Maybe not the gamma rays, but high-energy electro-magnetic waves, yes. There all around us, all the time, controlled by humans here on earth. 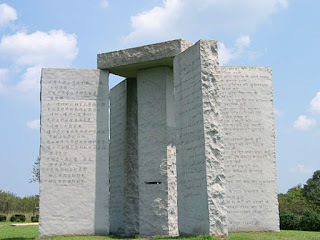 A New World Order is eminent and the Blue Beam Project is going to kick off the party, the same people who were behind the erection of the guide stones, are the same one's behind the Blue Beam Project. Attain the knowledge you need in order to prepare for the events that could happen here on earth. Open your soul to the level of consciousness we all must attain in order to save ourselves from enslavement by the powers that be. But maybe, just maybe, if this all goes down, what if it is the truth? Maybe this will be the rapture, Armageddon, end of days or whatever want to call it. Maybe the Mother-ships will take five hundred thousand to a million humans while the planet goes through a pole shift and mass natural disasters occur all over the planet. Maybe Blue Beam is apart of that pole shift, or at least to create enough destruction to make people think it's a pole shift. Who knows? All I know is that we are all living in the most exciting time in history. Disclosure of many things are getting ready to com-forth in the next coming years. Huge blue spirals in the sky. Pyramids a mile wide hovering over the Kremlin. Massive earthquake in the only county that considers Voodoo as their national religion. Things are happening that are unexplainable. As we move through 2010, please keep these thoughts in mind. May peace and love surround us all.